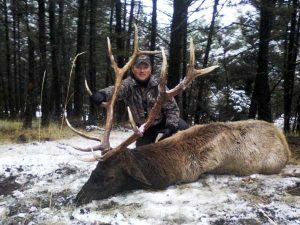 When it comes to popular venues for hunting elk, Idaho elk hunting consistently maintains its reputation as a haven for big game hunters. The state’s lush and various terrains make for a wonderful setting in which to take on the challenge of hunting this massive yet elusive creature. Thanks to progressive conservation methods, the elk population not only thrives but is able to provide hunters with a solid number of mature bulls each season. This allows hunters not only a greater opportunity for success but also ups the chance of hunters bagging the trophy elk they have always dreamed of. As with others, elk hunting has become a positive aspect for the Idaho state’s economy. This branch of tourism through big game hunts attracts guest hunters from many states over and hundreds of miles around. Whether successful or not, once a hunter gets a taste, many return year after year to experience the thrill of the hunt in a most majestic and peaceful setting. Local outfitters are able to adeptly provide a unique and thrilling experience for hunters, no matter what the skill level. Muzzleloaders, rifle and bow hunters are all given special attention during the fall hunting season. Those who decide to opt for Idaho elk hunting have a number of variables to choose from for their trip. There are both private and public hunting grounds available in many areas of the state. Most reputable outfitters have guide services for both options. Depending on skill level, there is a choice between drop camps or guided tours by horseback. One can rough it with their firearm, a bedroll and some food or hunters can opt to stay in a lodge or nearby motel for the duration. Outfitters also welcome groups of anywhere from four to six hunters at a time. Depending on the type of trip one is looking for, Idaho elk hunting can range from the extremely affordable to the best of one on one guide service. Those who know their way around an elk hunt will save more without a guide than those who opt for the executive service provided by many lodges. The higher priced outdoor guide services often take care of everything from licensing to transportation for their guests. However, when one is experienced with elk hunting and the surrounding area or returning to a familiar hunting spot, these services may not be necessary. In either situation, hunters who come upon the majestic wapiti are sure to have the kind of outdoor experience they will never forget.